^ a b c Helgen, K.M. (2005). "Family Castoridae". In Wilson, D.E. ; Reeder, D.M (eds.). Mammal Species of the World: A Taxonomic and Geographic Reference (3rd ed.). Johns Hopkins University Press. p. 842. ISBN 978-0-8018-8221-0. OCLC 62265494. ^ a b Naiman, Robert J.; Johnston, Carol A. & Kelley, James C. (December 1988). "Alteration of North American Streams by Beaver" (PDF). BioScience. 38 (11): 753–762. doi:10.2307/1310784. JSTOR 1310784. Archived from the original (PDF) on March 4, 2012. Retrieved February 28, 2010. ^ Christopher W. Lanman; Kate Lundquist; Heidi Perryman; J. Eli Asarian; Brock Dolman; Richard B. Lanman; Michael M. Pollock (2013). "The historical range of beaver (Castor canadensis) in coastal California: an updated review of the evidence". California Fish and Game. 99 (4): 193–221. Retrieved September 27, 2016. ^ Agar, Charles (March 24, 2008). "Beaver Deceiver expert coming to Pitkin County". The Aspen Times. Aspen, Colorado. Retrieved November 22, 2009. ^ Erlandsen, S. L. & Bemrick, W. J. (1988). "Waterborne giardiasis: sources of Giardia cysts and evidence pertaining to their implication in human infection". In Wallis, P. M. & Hammond, B. R. (eds.). Advances in Giardia research. Calgary, Alberta, Canada: University of Calgary Press. pp. 227–236. ISBN 978-0919813861. ^ Brenner, F.J. (1960). 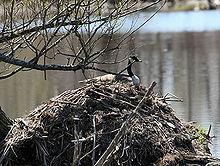 "Canada geese nesting on a beaver lodge" (PDF). The Auk. 77 (4): 476–477. doi:10.2307/4082428. JSTOR 4082428. Retrieved March 1, 2010. ^ Mitchell, C.D. (1994). A. Poole; F. Gill (eds.). Trumpeter Swan (Cygnus buccinator). In The Birds of North America No. 105. Philadelphia: The Academy of Natural Sciences. p. 10. ^ McKelvey RW; Denningtonz MC; Mossop (1983). "The Status and Distribution of Trumpeter Swans (Cygnus buccinator) in the Yukon" (PDF). Arctic. 36 (1): 76–81. CiteSeerX 10.1.1.581.427. doi:10.14430/arctic2245. JSTOR 40509470. Retrieved March 1, 2010. ^ Johnson, Glenn E. & van Riper III, Charles (2014). "Effects of reintroduced beaver (Castor canadensis) on riparian bird community structure along the upper San Pedro River, southeastern Arizona and northern Sonora, Mexico" (PDF). U.S. Geological Survey Open-File Report 2014-1121. Retrieved January 23, 2015. ^ a b c Pollock, M. M.; Pess, G. R. & Beechie, T. J. (2004). "The Importance of Beaver Ponds to Coho Salmon Production in the Stillaguamish River Basin, Washington, USA" (PDF). North American Journal of Fisheries Management. 24 (3): 749–760. doi:10.1577/M03-156.1. Retrieved February 28, 2010. ^ Ryan L. Lokteff; Brett B. Roper; Joseph M. Wheaton (2013). 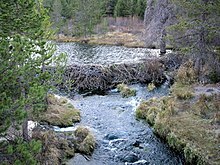 "Do Beaver Dams Impede the Movement of Trout?" (PDF). Transactions of the American Fisheries Society. 142 (4): 1114–1125. doi:10.1080/00028487.2013.797497. Retrieved December 23, 2013. ^ Bryant, M. D. (1984). Walton, J.M. ; Houston, D.B. (eds.). 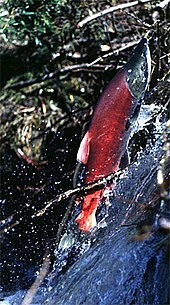 "The Role of Beaver Dams as Coho Salmon Habitat in southeast Alaska Streams". Proceeding, Olympic Wild Fish Conferences. Port Angeles, Washington: Peninsula College, Fisheries Technology program: 183–192. ^ a b c Collen P, Gibson RJ (2001). 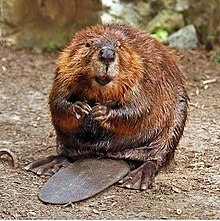 "The general ecology of beavers (Castor spp. ), as related to their influence on stream ecosystems and riparian habitats, and the subsequent effects on fish – a review" (PDF). Reviews in Fish Biology and Fisheries. 10 (4): 439–461. doi:10.1023/a:1012262217012. Retrieved March 2, 2010. ^ Ben Goldfarb (November 9, 2015). "The beaver whisperer". High Country News. Retrieved March 12, 2016. ^ O'Connor, Anahad (February 23, 2007). 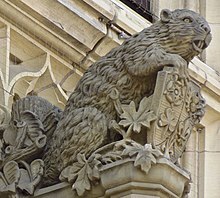 "After 200 Years, a Beaver Is Back in New York City". The New York Times. Retrieved December 4, 2009. ^ Design Trust for Public Space (June 17, 2009). "Bronx River Crossing". Retrieved December 4, 2009. ^ a b Boehm, Kiersten (November 14, 2008). "Lincoln Park Beaver Relocated". Inside at Your News Chicago, IL Edition. Retrieved December 4, 2009. ^ Greenfield, John (May 7–13, 2009). "Why are there signs that claim the Park District murdered a beaver?". Time Out Chicago. Retrieved December 4, 2009. ^ George, Aleta (2008). "Martinez Beavers". Bay Nature. Bay Nature Institute. Retrieved November 6, 2009. ^ DeRobertis-Theye, Nicola. "Beavers and More in Martinez:New Habitat Thanks to Beavers". Bay Nature. Bay Nature Institute. Retrieved November 6, 2009. ^ Aiken, Jonathan (April 7, 1999). "Beaver is bad guy at cherry blossom time". CNN. Retrieved November 22, 2009. ^ Wheeler, Linda (April 7, 1999). "Beaver Chomps Into Cherry Blossom Season". The Washington Post. Retrieved November 22, 2009. ^ Nummi, Petri. "NOBANIS – Invasive Alien Species Fact Sheet – Castor canadensis" (PDF). Online Database of the European Network on Invasive Alien Species. NOBANIS. Retrieved October 2, 2014. ^ International, Radio Canada (April 23, 2015). "History: Apr. 23, 1851, Canada issues first stamp". RCI | English. Retrieved May 29, 2017.